The pair as seen from the desert Southwest just after Antares emerged from behind the moon June 6. The view and timing will be different for each location. As the moon makes its monthly circuit around the sky it often passes in front of stars, blotting them out for as much as an hour or so. Such an occultation can be a startling spectacle, especially if the star is bright. The star appears to creep up to the moon's limb, hang on the edge for a minute or two, and then, without warning, wink out. Later it flashes back into view just as suddenly on the moon's other side. The suddenness with which occultations take place was one of the first proofs that the moon has no atmosphere. If our satellite were surrounded by a blanket of air, a star approaching its limb would fade gradually, like one seen setting on Earth. An excellent occultation will happen on Saturday evening, June 6 for most of the United States and a portion of south-central Canada. The ruddy 1st-magnitude star Antares will be covered by a moon only about 16-hours from the moon's full phase. For naked-eye viewers the moon's glare will seriously hinder the visibility of Antares, so block as much of the moon as you can with a finger or the edge of a building. See viewing times and details below. Binoculars should pull the star in well, and a small telescope will afford a superb view. Antares is the brightest star of the most beautiful of the 12 zodiacal constellations, Scorpius, the Scorpion. Scorpions have two large claws in front, but this one seems to have had his claws clipped. The Romans decided that there should be 12 constellations in the zodiac, instead of 11, so they made the two claws of Scorpius into the arms of Libra, the Balance. The whole figure of the scorpion is a magnificent sight; best appreciated in a dark sky without any interference from bright moonlight. It really looks like a scorpion; a long stinging tail curled over its back. Antares clearly outshines all the other stars in this constellation; its fiery reddish tinge emphasizing the scorpion’s sinister appearance. Antares was known as the "rival of Mars," Ares being Greek for Mars. It's a supergiant star, located 604 light-years away. It's over 9,000 times as luminous as the sun and 700 times as large. If the sun were the size of a baseball, Antares would measure 169-feet across. There will be an exceedingly narrow dark strip of the moon behind which Antares will disappear along the moon's upper left limb; it will emerge back into view behind the moon's bright limb. The timing depends on your location. In the U.S. Southwest, Antares will disappear in the early evening hours (around 10:10 p.m. ET/7:10 p.m. PT) -- still daylight for some locations. Over southern New England and upstate New York, it will disappear around 11:00 p.m. ET, when the moon will be low in southeast sky. Over the Central States up into southern Ontario, moon and star will be even lower in the southeast with Antares vanishing between roughly 8:50 p.m. CDT (over Texas) to about 9:30 p.m. CDT (around the Great Lakes). It will also be in the midst of bright evening twilight. In the East, between 11:20 and 11:30 p.m. EDT. Over the central states and south-central Canada, Antares will reappear between 10:10 and 10:20 p.m. CDT. Over the Mountain States, the moon will have just risen, when Antares pops out it will be around 9:00 p.m. MDT and over the Southwest, it'll be just before 8:00 p.m. PDT. For detailed predictions for hundreds of cities and towns have been compiled by the International Occultation Timers Association (IOTA) and can be found here. Northern New York State, central and northern New England as well as northern California and the Pacific Northwest will unfortunately be outside the occultation zone. 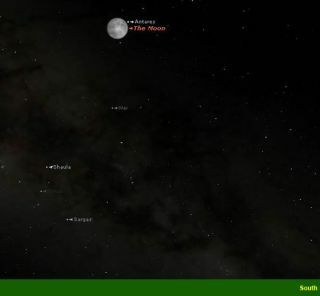 As a result, the moon will appear to slide just below Antares, and narrowly missing it. From Boston, for example, Antares will appear to practically sit on the moon's upper left edge at 11:17 p.m. EDT. You won't be able to see this with the naked eye, but in binoculars, Antares will seem to sparkle like a tiny red jewel immediately adjacent to the moon's rim; a small telescope will give a much better view.